The last of the Psycard pack is Union. It promises togetherness and wholeness - the bringing together of men and women, yin and yang, conscious and unconscious, the warring elements of self and it suggests your inner energies are combining to a nobler and fuller life. What happens between man and woman is symbolic of what happens in other areas: in religion, politics and all human affairs. A coming together is blessed, sanctioned and approved by the Heavens and Earth, Church and State in a way that fits into the whole. Click here to buy your own deck at the store page. Click here for a reading from Mollie. 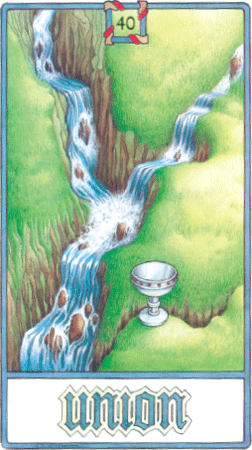 Psycards were invented by Nick Hobson in 1980’s in the UK to help others who were experiencing personal difficulty to achieve the perspective – and peace.